Our key publication for practitioners, the Toolkit for Father-Inclusive Practice is an attractive, boxed set of 15 colour-coded cards, well designed, with insightful cartoons. The Cards chart 8 logical and easy-to-follow Steps for developing father-inclusive services (i.e. for ensuring that issues relating to fathers and fatherhood are effectively addressed in all services delivered by an agency). Also included is a Research Summary of the benefits of father-inclusive practice to children and mothers; a Legal Briefing (which explores issues of confidentiality, data collection and Parental Responsibility); and Resources sections. The Toolkit is designed to help managers and practitioners meet the strong policy requirements for father-inclusive services coming from the Department for Children, Schools and Families, and elsewhere: in the Children’s Centre Guidance, the Childcare Act 2006, the National Services Framework for Children, Young People and Maternity Services, the Teenage Pregnancy Strategy, the Gender Equality Duty (in the Equality Act, 2006), and so on. 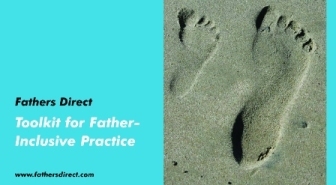 The Toolkit’s 8-Step approach also informs the Fatherhood Institute’s training and consultancy services and underpins our kite-marking system for father-inclusive practice – the Fatherhood Quality Mark – promoted by DCSF/HM Treasury in Aiming high for children: supporting families (2007). The Toolkit is an invaluable aid for the managers of agencies which engage with fathers but also – since it is so easy to follow – for each frontline worker within it. The Toolkit also complements a range of specialist Fatherhood Institute guides to working with, for example, African Caribbean fathers and Muslim fathers, and with fathers in drugs & alcohol services. Click here to read what people who have already bought the Toolkit think of it. Buy the Toolkit through our website shop.